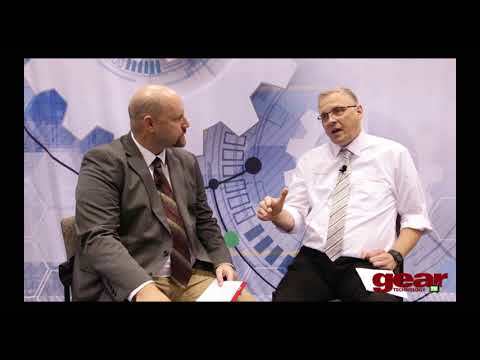 Gleason Bevel Gear Technology is written for specialists in planning, engineering, gear design and manufacturing; in short — you. This work also addresses the technical information needs of researchers, scientists and students who deal with the theory and practice of bevel gears and other angular gear systems. Indeed — it is the first textbook available worldwide that not only addresses all the above — it also provides methods and practical hints for their application. The introductory chapters lead engineers — and students without gear experience — in easy-to-understand language (and nomenclature) through the basics of modern cylindrical and bevel gear technology. Next, the fields of industrial application of bevel gears are illustrated via vivid photographs of examples with supplemental explanation of why such products require bevel or hypoid gears. The third part of the book is dedicated to roll testing, coordinate measurement and corrections of bevel gears. The heat treatment of bevel gears appears after the chapters on manufacturing methods. Because heat treatment is not a bevel gear-specific technology, this progression of chapters makes sense in terms of enhancing continuity and flow in reading. Are there flank forms which can satisfy the mentioned requirements? Is it possible to manufacture those flank forms efficiently? Will there be sufficient overlap during the change from one pair of teeth to the next? And, even then, will the engagement of the consecutive tooth pairs be smooth or will there generally be a load dependent impact? The search for a suitable flank form is the subject of this paper. Therefore, a general case and its two special cases will be observed. Figure 1 General transmission case and its two special cases. The right lower graphic in Figure 1 shows the second extreme. The two radius vectors are perpendicular to each other, which causes the pair of normal vectors to be perpendicular to R1 — but parallel to R2. The left vector product in Equation 3 delivers therefore the absolute amount of R1, where the right vector product delivers the “zero” as a result. This means that an instant rotation of element 2 has no influence on the position of element 1. The three discussed cases show an extreme change of the transmission ratio dependent on the rotational position of the contacting elements (Ref. 1). A crossed belt drive presents similar conditions (Fig. 2) (a straight line connects two circles). Figure 2 Line of constant vector products. If the finite surface elements are connected with the respective disk, then based on disk 1 in Figure 3, the rotation of the surface element “a” around Axis 1 about the angular increment between Ra and Rb rotates the green element “a” up, in the position at the arrow tip of Rb. This equals the rotation required in order to move from contacting point “a” to contacting point “b” along the connecting line (Fig. 2). The connecting line (Fig. 1.) 2 becomes the line of engagement in Figure 3. Figure 3 Surface elements that fulfill constant vector products. Figure 4 Continuum of connecting points. The dashed lines in Figure 4 symbolize the cord in discrete, unwound positions. The end of the unwound cord traces a curve — i.e., flank form — which mathematically represents an involute. The right part of Figure 4 demonstrates the tooth form in case of a standard pressure angle (α1,2) and in case of a small pressure angle (α3,4), assembled from a left and right flank. 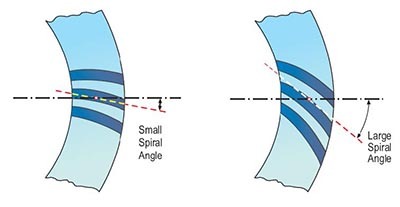 Both tooth forms (pressure angles) can be generated from the same involute (Fig. 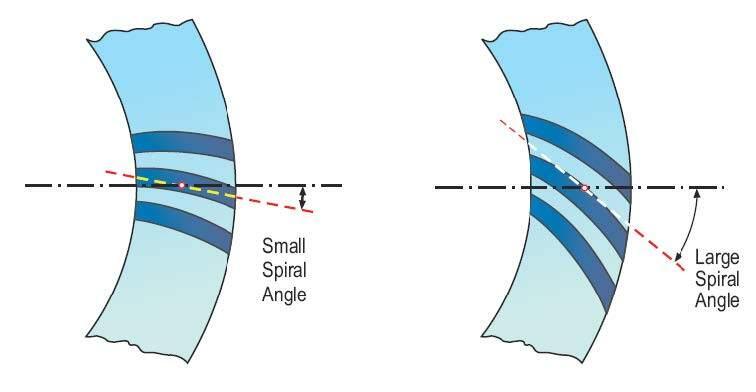 4, left) by choosing the section of the tooth depth (height) closer to the base circle (small pressure angle) or radially farther away from the base circle. 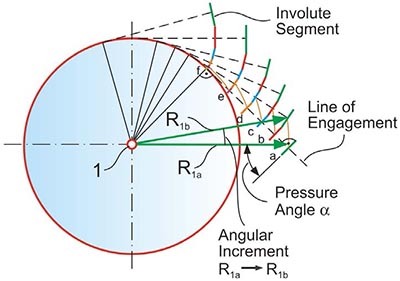 If the pitch diameter should remain constant during a pressure angle change, it is, for example, possible to reduce the base circle diameter in order to increase the pressure angle. 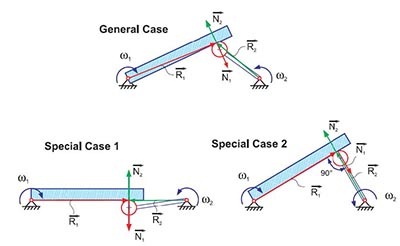 The requirement to keep the crossproduct for each of the transmission elements independent from one another and constant, as well as the idea of employing the functionality of a crossed belt drive as an example for the movements of finite surface elements, led without any mathematical derivations or analysis to an interesting solution. The involute has a number of remarkable properties (in contrast to other flank forms), like its manufacturability via a simple trap-ezoidal rack profile and its insensitivity to center distance changes between two engaged gears. A continuous transmission of rotation between two axes is not possible with only a single involute on the circumference of each of two engaged disks. A continuous transmission requires the continuation of the rotational transmission process by the discrete pair of involutes on several positions along the circumference of each disk. The repetition of the flank structure is illustrated in Figure 5. The angular distance of the teeth along the circumference of a disk is called “pitch” or “circular pitch.” Using the relationship between module and pitch in Equation 6 assures sufficient overlap during the change of transmission contact from one pair of teeth to the next. 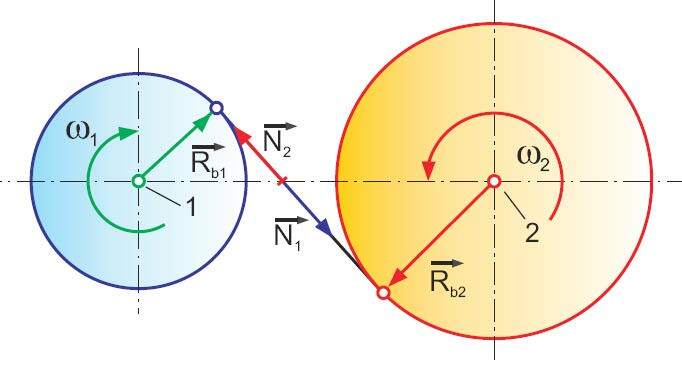 In order to allow transmission in both rotational directions it is necessary to develop an opposite involute as a mirror image of the first developed involute. The opposite involute can be developed using a line of engagement which corresponds to the second part of the crossed belt. The angular distance between the two involutes of one tooth is normally defined as half-apitch reduced by half-the-amount of the desired backlash. The module is introduced in order to standardize the tooth proportions; Figure 5 includes the most important tooth proportions. The addendum is larger than the dedendum to assure that the tops of the mating gear teeth can pass the root area without interference. 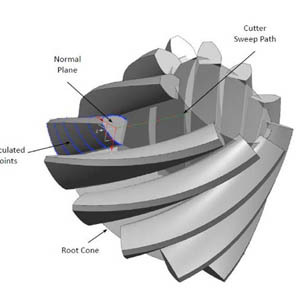 In addition, the extra space in the root area is used for a root fillet radius as a transition between the involute flank and root bottom. The interaction between two involutes is schematically shown (Fig. 6). 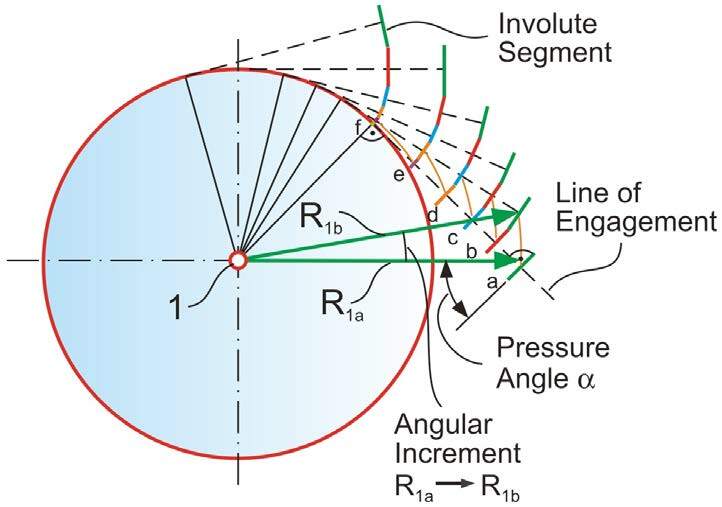 Figure 6 Center distance insensitivity of involute gearing. A generating rack as shown (bottom, Fig. 7) has cutting edges that are oriented perpendicular to the line of engagement. One edge of the trapezoidal profile (Fig. 7) is drawn to match the pitch point. Figure 7 Involute development with straight generating rack. 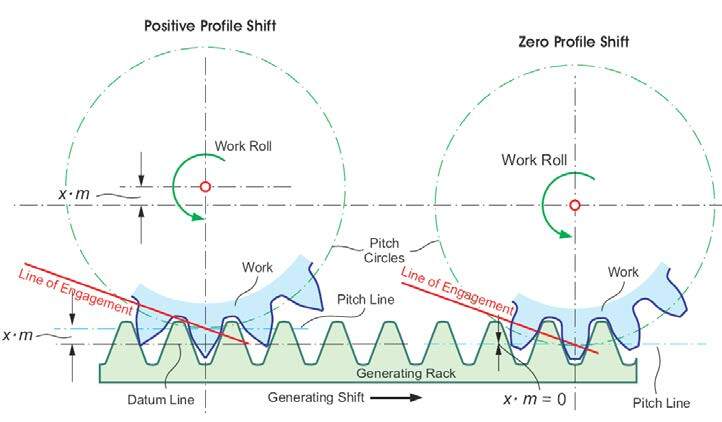 A horizontal shifting of the generating rack to the right creates at the right side of the observed center tooth the addendum profile (or the lower part of the involute in Figure 7); and on the left side of the same tooth the dedendum profile. The gear is rotated counter-clockwise during this generating rack shift as if the pitch circle of the gear would roll on the pitch line of the generating rack without any sliding. The straight cutting edge profile will be perpendicular to the line of engagement in any shift position — which is why this arrangement fulfills the requirements of the involute forming process — as shown with the cord construction. 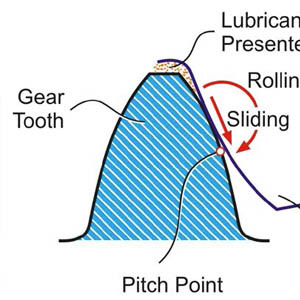 The right part of Figure 7 explains how a work gear shift away from the rack with an amount of × * m leads to a shorter involute between the pitch line and the root and to an extended involute between the pitch line and the tip of the tooth (a different section of the same involute is used). 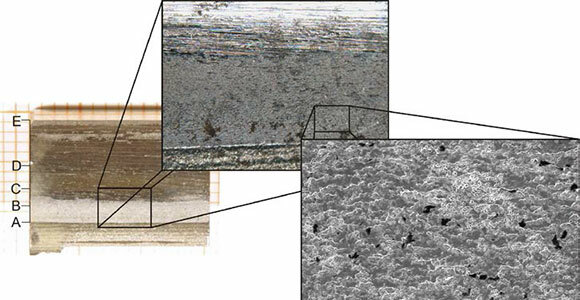 As result, a stubby tooth with larger tooth root thickness and reduced tip thickness is generated. The tendency of a so-called “undercut” condition (compare Figure 7, left and right) is eliminated due to this work gear shift. The work gear shift is called “profile shift” (or addendum modification). If the gear with profile shift is mated with a “zero profile shift gear,” then the pair has a center distance, which is enlarged by the amount of the profile shift. In order to re-establish the theoretical center distance, the mating gear can be manufactured with the same amount of profile shift — but with a negative sign. 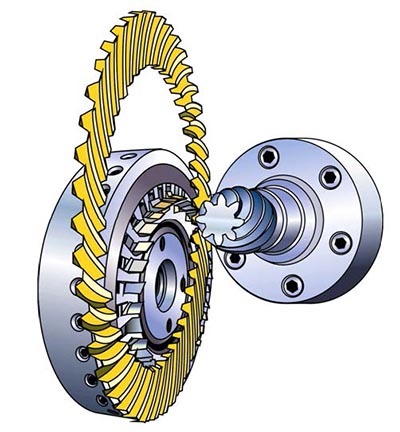 Such a gearset is called a “V0 pair;” it can be exchanged in an existing gearbox with a non-profile shifted set. V0 pairs keep their pitch circles as operating roll circles. 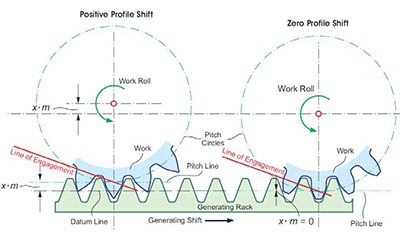 In the case of varying profile shifted pairs — in addition to the change in center distance — a change in the operating roll circle and a change in the operating pressure angle is observed. Every combination between varying profile shifted gears is possible and has no influence on the transmission ratio; i.e. — the constant transmission of rotation (Refs. 2–3). This manufacturing principle via toothed rack exists in practical form as a planing method (Fig. 8, left). 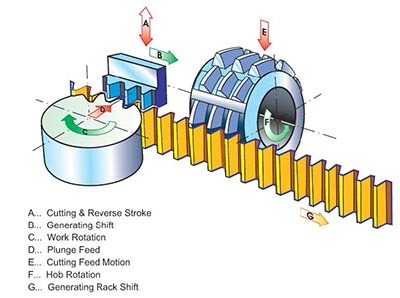 A reciprocating planing rack — which performs a combination of cutting and withdrawn reverse stroke — is shifted sideways while the work gear rotates a predetermined amount in order to generate the involute profile. For soft cutting, “threaded” hobs (Fig. 8, right) are mostly used. The discrete cutting blades are grouped along a helix on the surface of a cylinder. Figure 8 Manufacturing of involute tooth forms. Hobs are swiveled to an angular position in order to compensate for the helix lead angle. During the continuous hob rotation, a feed motion moves the hob along the face width of the work gear (“E” in Fig. 8). In case of a single start hob, the work gear will rotate one tooth (one pitch) during one hob rotation. A number of other methods for the manufacture of involute gears are also derived from the generating principle with a trapezoidal rack. The so called profile cutting or grinding methods are based on cutting or grinding tools whose tooth forming profile sections represent a negative “involute.” Profile tools are more difficult to manufacture than generating tools, and are more sensitive to positioning errors and process related kinematic, i.e. — dynamic influences. It is possible to apply the conclusions of the preceding sections in a similar form also to three-dimensional gearing applications. 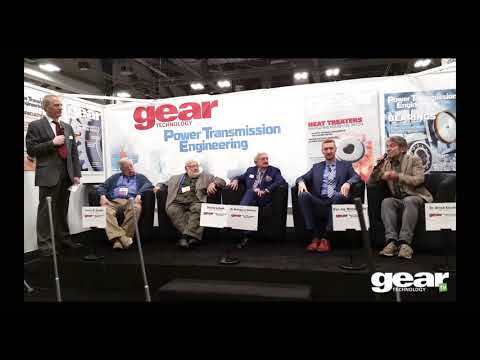 If motion and force should be transmitted between two non-parallel axes, the solution beyond to worm gear drives and crossed helical gear drives is the most remarkable case in gearing — bevel gears. These are angular transmissions with conical gears that have straight or curved teeth in direction of the face width. Depending on the axes orientation, bevel gears are divided in straight or spiral bevel gears with intersecting axes, and hypoid gears with crossing axes which are separated by an offset. The different bevel gear types are explained in Chapter 3 in detail with their properties and applications. The conclusion from “N to N + 1” from the cylindrical gear to the bevel gear can be created intuitively if the generating rack (Fig. 8) is placed on a flat surface and then bent around a vertical axis (Fig. 9). 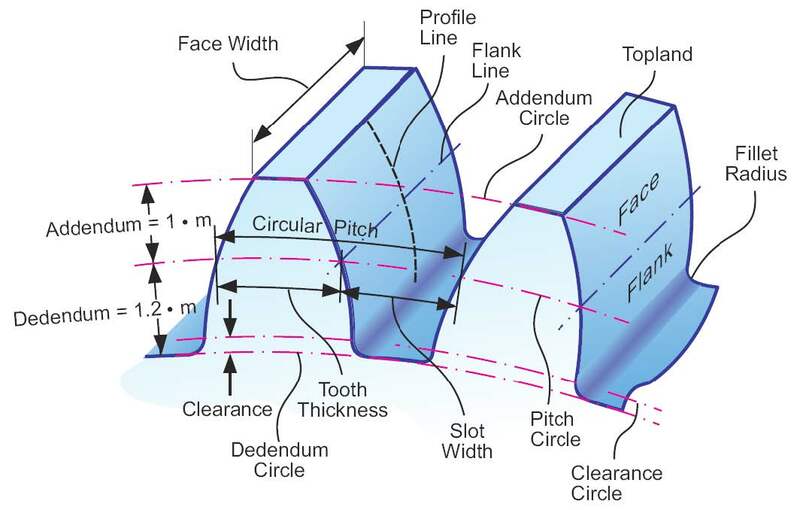 If the rack is imagined to consist of thin, elastic material, then only the cylindrical section through the middle of the face width of the toothed ring (Fig. 9) shows the original trapezoidal rack profile (Fig. 8), i.e. — rolled on the surface of said cylinder. The trapezoidal profile reduces in size proportionally towards the center and enlarges proportionally towards the outside. If this proportional profile distortion does not only apply in circumferential direction but also in vertical direction, then the optimal generating gear for straight bevel gears has been created. This leads to a simple explanation of the generating principle in Figure 9. If a disk from modeling clay is pressed from the top into the profile of the generating gear and a slip free rotation between disk and generating gear occurs, then teeth with nearly involute profiles are formed. The profiles formed in this experiment are spherical involutes, or octoids of the first kind. If the same experiment is repeated with a disk from modeling clay from the lower side of the generating gear, then a second bevel gear with an octoid profile is created. Remarkably enough, in the conducted brain experiment the most elementary case of the kinematic coupling requirements between two gears has been realized. If it is possible for the upper bevel gear to engage in a perfect meshing condition with the generating gear — and if the lower bevel gear can engage in a perfect meshing condition with the mirror-imaged bottom side of the generating gear — then the generating gear (which has only a virtual character) can be removed and the two bevel gears will mesh perfectly with each other as well. This leads to the formal definition of the kinematic coupling requirements. Figure 9 Generating principle of straight bevel gears. With all coupling requirements satisfied, the ring gear flanks are conjugate to the pinion flanks. (The term conjugate is used in mathematics for two or more surfaces which contact each other along a line. Since the 1980s the term conjugate is also employed in the gear technology literature to define the “exact” gear pair which presents a triple plurality of line contact between two gear flanks during the meshing process (Ref. 4). This book will apply this application of the term conjugate according to the following definition, since it is commonly used today. A functional and conjugate bevel gear set can be generated even if not all requirements from above are fulfilled. This will require the implementation of certain corrections. However, the robustness and stability of a certain design will be diminished when fewer of the kinematic coupling requirements are satisfied. The violation of a coupling requirement and the resulting consequences to the functionality are not connected like binary conditions. An increasing deviation from a single requirement results in an increased limitation in the roll and transmission quality of a gearset. When the involute flank generation of cylindrical gears was applied to bevel gears in Figure 9, the trapezoidal gener-ating profile with plain “side walls” was used as the basis for the plain generating gear for straight bevel gears. The generating principle of conjugate flank pairs between pinion and ring gear works for a wide variety of flank length forms as long as certain rules are respected. It is, for example, possible to expand the function of the straight tooth plain generating gear of Figure 9 to a plain generating gear with curved teeth and subsequently arrive at Figure 10. At the left side of the generating gear (Fig. 10), a cutter head is shown that has blades that are oriented a certain distance from the cutter head center, which represent one tooth of the generating gear. This arrangement allows for a continuous rotation of the cutter head that results in an efficient chip removal in the tooth slots. 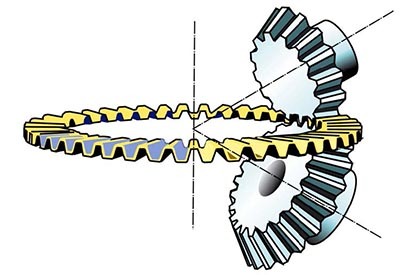 The teeth of the resulting spiral bevel gear are oriented under an angle to the radial orientation of the straight bevel gear teeth (Fig. 9). A radial section (with an axial plane) will cut through two or even more teeth. This means for the pinions and gears manufactured with the generating gear in Figure 10, that more than one pair of teeth is in mesh and participates in the transmission at any time. This effect, called the “modified contact ratio,” results in larger transmittable torques and a smoother rolling of the flanks. Figure 10 Generating principle of spiral bevel gears. An intuitive justification of the step from straight teeth to curved teeth is demonstrated in Figure 11. Figure 11 Model for creation of curved teeth and explanation of spiral angle. The straight teeth to the left (Fig.11, top) are divided into more and more segments; the segments are then rotated along the face width from left to right. An infinite number of segments with infinitesimally small rotations deliver eventually the spiral bevel teeth (right, Fig. 11, top). The definition of the spiral angle is demonstrated in the lower part of the same figure (the drawing plane is equal to the generating plane). The rules regarding the shape of the flank line curves (and pressure angle) that have to be followed in order to assure undisturbed meshing will be summarized in the second half of this chapter, which will appear in the next issue of Gear Technology. The second half also delves into more detail with regard to the different methods of generating bevel gear teeth. At the beginning of this chapter some thoughts about plausible explanations of the gearing law were discussed. Involute gearing was then presented as the consequential result of the engineering demand for a robustly functioning, easy-to-manufacture tooth form. Buckingham, E. Spur Gears, McGraw-Hill Book Company, Inc., New York and London 1928. Niemann, G. and H. Winter. Maschinenelemente I, II & III, Springer-Verlag Berlin, Heidelberg, New York, Tokyo, 1983. Dudley, D. Dudley’s Gear Handbook, McGraw- Hill, Inc. New York 1991. Kegelradgetriebe,” Dissertation, RWTH Aachen, 1983. Stadtfeld, H.J. “Anforderungsgerechte Auslegung bogenverzahnter Kegel-Radgetriebe,” Dissertation, RWTH Aachen, 1987. Brandner, G. “Kreisbogenverzahnte Kegelräder,” Maschinenbautechnik, 3. Jg. Issue 5 May 1954. Richter, E.H. “Geometrische Grundlagen der Kreisbogenverzahnung und ihre Herstellung,” Konstruktion, Issue 3, 1958. Dr. Hermann J. Stadtfeld received in 1978 his B.S. and in 1982 his M.S. degrees in mechanical engineering at the Technical University in Aachen, Germany; upon receiving his Doctorate, he remained as a research scientist at the University’s Machine Tool Laboratory. 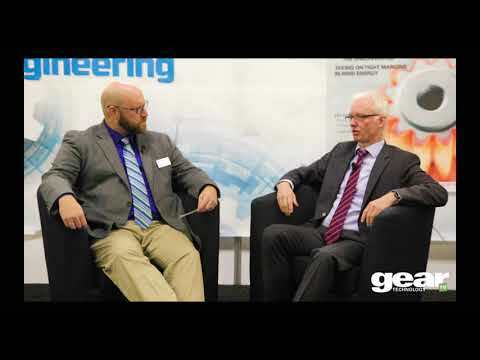 In 1987, he accepted the position of head of engineering and R&D of the Bevel Gear Machine Tool Division of Oerlikon Buehrle AG in Zurich and, in 1992, returned to academia as visiting professor at the Rochester Institute of Technology. Dr. Stadtfeld returned to the commercial workplace in 1994 — joining The Gleason Works — also in Rochester — first as director of R&D, and, in 1996, as vice president R&D. 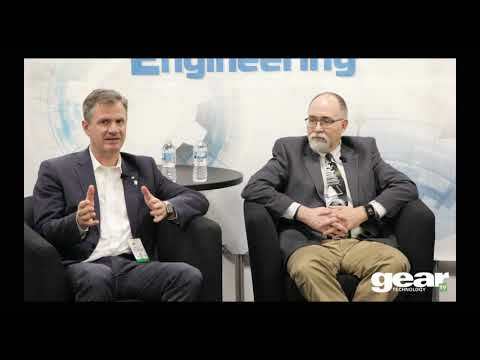 During a three-year hiatus (2002-2005) from Gleason, he established a gear research company in Germany while simultaneously accepting a professorship to teach gear technology courses at the University of Ilmenau. 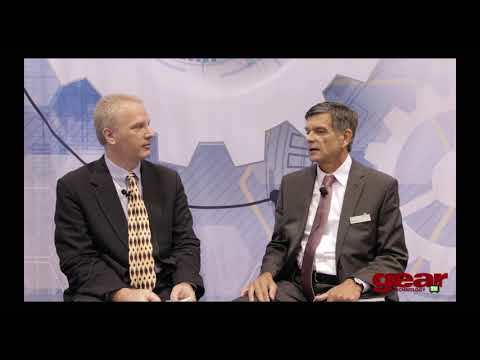 Stadtfeld subsequently returned to the Gleason Corporation in 2005, where he currently holds the position of vice president, bevel gear technology and R&D. 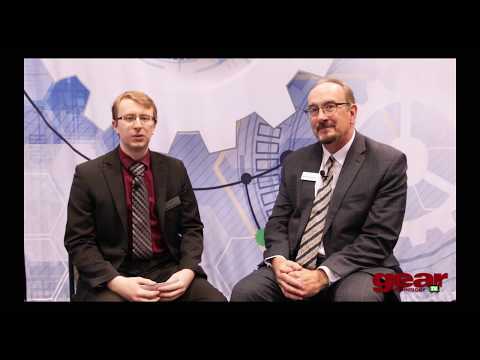 A prolific author (and frequent contributor to Gear Technology), Dr. Stadtfeld has published more than 200 technical papers and 10 books on bevel gear technology; he also controls more than 50 international patents on gear design, gear process, tools and machinery. 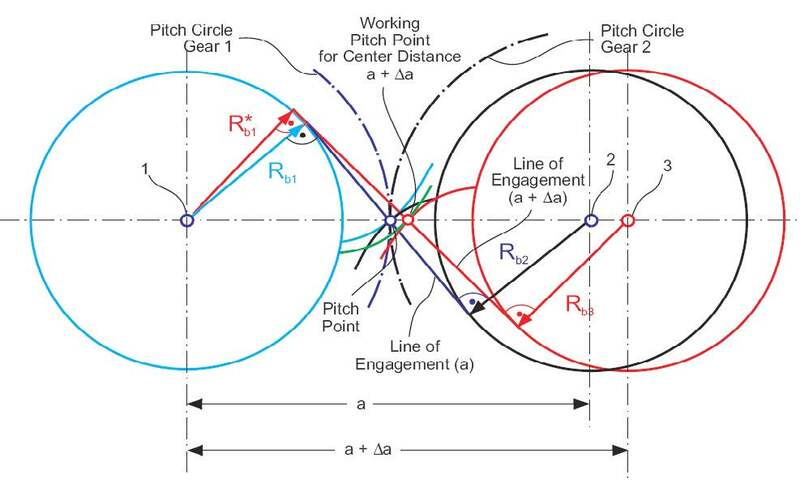 The article "The Basics of Gear Theory" appeared in the June 2015 issue of Gear Technology.